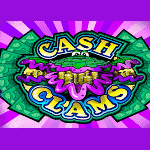 Cash Clams is one of the many classic slot games coming from the rich Microgaming portfolio. The theme of the game is Clams and seafood in general. The slot doesn’t have modern animations installed due to its old age, but the symbols are well designed and have a great choice of colors. If you like playing classic slots Cash Clams is sure to catch your attention. 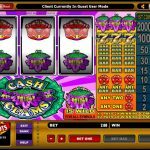 Since Cash Clams is a classic slot you won’t find any classic bonus features like you would normally do in modern video slots. 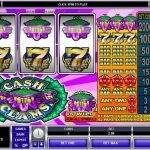 The slot has only one pay line so winning combinations are formed by landing matching symbols on the pay line. The Clam symbol is the wild symbol in the slot and it will substitute for all other game symbols. Once he substitutes in a win the payout will be doubled in size. If two wild symbols substitute in a winning combination the payout will be quadrupled in size. The wild has the highest payout in the slot with 2.000 or 5.000 coins depending if you are playing with 1 or 2 coins per bet line. This is why we recommend to always play the game with the maximum two coins per line. The rest of the game symbols also have decent payouts. The Golden Seven will award a 200 coins payout if three of them land on a pay line. The Triple, Double and Single Bars will award a 100, 60 and 30 coins payout, while any Bars combination awards a 20 coins payout. Classic Microgaming slots still attract a decent number of players despite their old age. The main reason for this is their big payout potential, thanks to the strong pay table and the single pay line. Even though the slot has very little to offer on a visual level the payouts make it worth playing. If you like classic slots and big jackpots then you should consider playing Break Da Bank a 3 reel slot by MicroGaming.